With Handel Alexander’s Feast just around the corner (Feb 22-25 at Koerner Hall), we’re looking back at poster designs created at the top of the season. As always, our multi-talented Choir director Ivars Taurins provided some inspirational art to help guide the design process, and we’re happy to share them with you! The Family of Darius before Alexander is a 1565–1570 oil on canvas painting. It depicts Alexander the Great with the family of Darius III, the Persian king he had defeated in battle. Although Veronese had previously painted a version of the subject, since destroyed, the theme had rarely been depicted by other artists before him. The painting has been in the collection of the National Gallery in London since 1857. Interestingly, the splendid wardrobe is that of the Venice in which Veronese lived, rather than ancient Greece or the Far East. 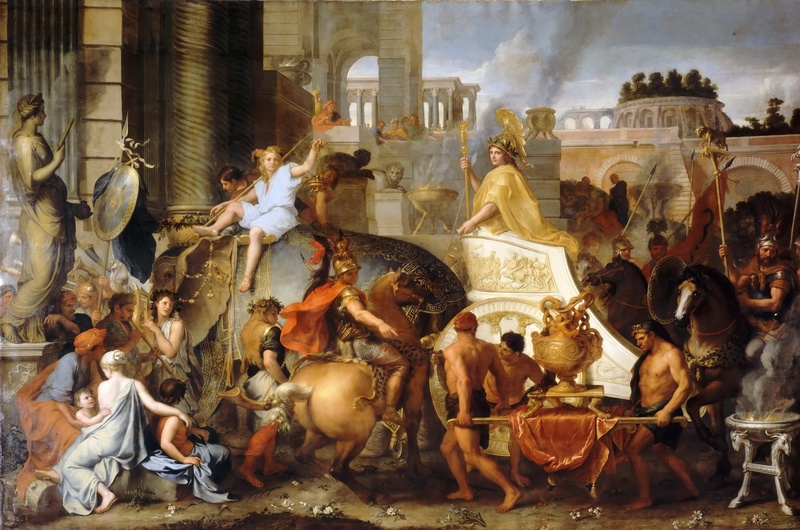 Alexander, standing in a chariot drawn by two elephants, makes his triumphant entry into Babylon; in the background, one can make out the terraces of hanging gardens. Charles Le Brun needed to find a style with the appropriate blend of gravity and solemnity. It was also necessary to maintain the legibility crucial to a work with so many figures, while conveying the diversity of the temples, vases, weapons, musical instruments, and costumes that make the scene immediately recognizable. An allusion to the grandeur of the reign of Louis XIV – who was also a great conqueror and powerful monarch – is evident, the political position clearly stated. Later reproduced as a tapestry, the painting was part of the collections of Louis XIV. From the Royal Collections, the work entered the Muséum Central des Arts, which would later become the Louvre. This painting was probably completed at the end of the year 1660. It shows the mother of Darius throwing herself at the feet of the king of Macedonia, to implore clemency for his imprisoned family. 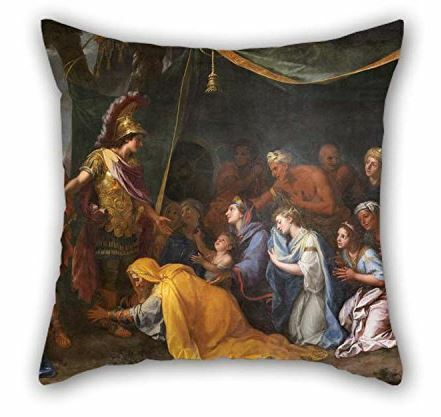 And hey – why not grab the throw pillow version of the painting? And so – the final product from Sovereign State (note the baroque frame around the imagery)! 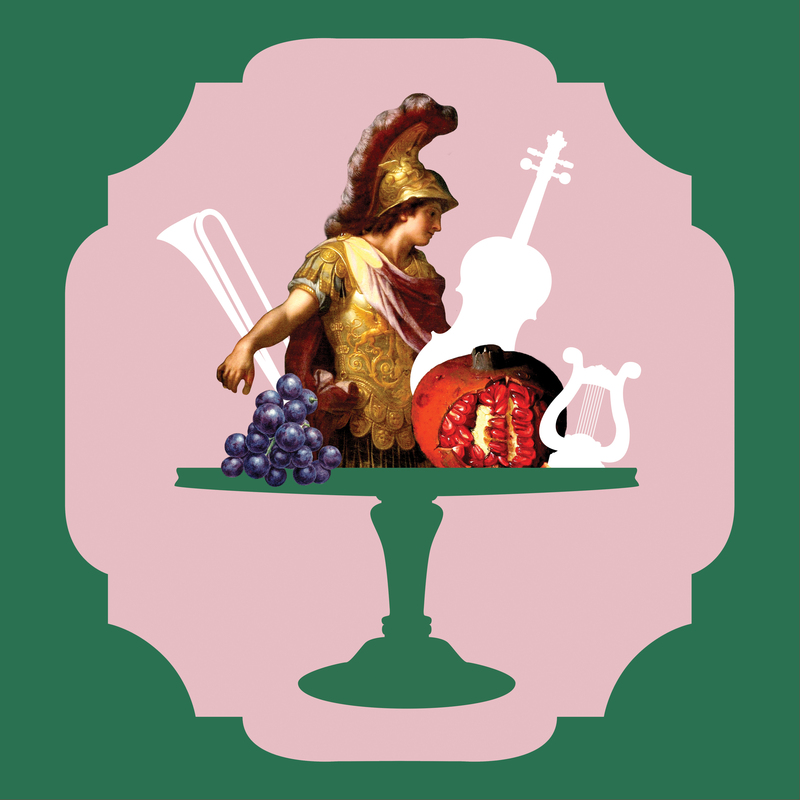 This final image used the figure of Alexander from the final Le Brun painting, as well as opulent fruits, silhouettes of baroque instruments, and a baroque platter silhouette! We look forward to seeing you at Handel Alexander’s Feast, February 22-25 at Koerner Hall, TELUS Centre. Performances of odes on November 22, the feast day of the patron saint of music, St. Cecilia, were a regular feature of the concert season in London at the end of the seventeenth century. John Dryden’s ode, Alexander’s Feast, or the Power of Musick, was written for the occasion in 1697, set to music (now lost) by Jeremiah Clarke. From 1700 the tradition died out, but composers continued to write settings of St. Cecilia odes as concert works. 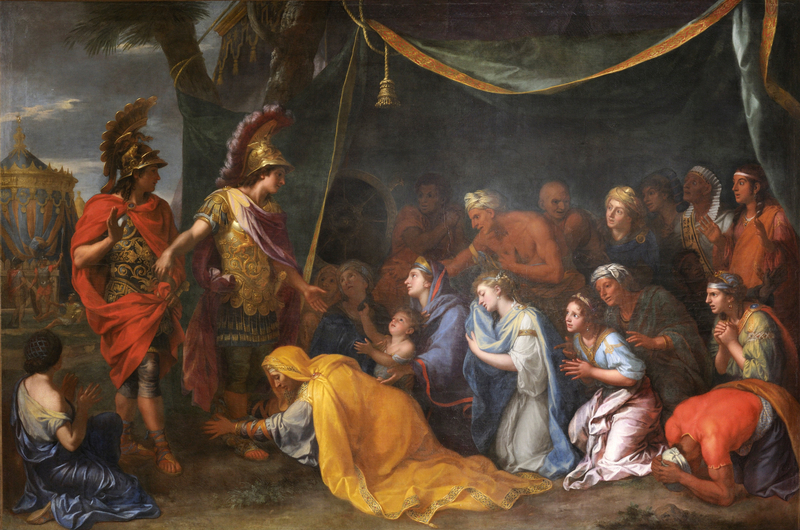 Handel composed two such odes, the first being Alexander’s Feast in 1736. (The second, From Harmony, from heavenly Harmony, followed three years later). The premiere of Alexander’s Feast took place at Covent Garden on February 19, a few short weeks after Handel completed the score. Dryden’s text was adapted by Handel’s friend, the Irish playwright Newburgh Hamilton, who “took care not to take any unwarrantable liberties” with Dryden’s original. Last Night Mr. Dryden’s Ode, call’d Alexander’s Feast, was performed at the Theatre Royal in Covent Garden, to a splendid Audience, where his Royal Highness the Prince and Princess of Wales were present, and seem’d to be highly entertain’d, insomuch that his Royal Highness commanded Mr. Handel’s Concerto on the Organ to be repeated. Engraved portrait of Handel by Jacobus Hoebraken, with frame and cartouche engraved by Gravelot, 1738, for the first edition of the score of Alexander’s Feast. The libretto describes a banquet held by Alexander the Great and his mistress Thaïs in the captured city of Persepolis. The musician Timotheus sings and plays his lyre, inciting various emotions in Alexander until he is roused to burn the city in revenge for his fallen soldiers. Cecilia arrives to turn the barbarity to a more uplifting end through her “loftier” music. The baroque triple harp was one answer to accommodate the expanding musical language that was emerging at the turn of the seventeenth century. 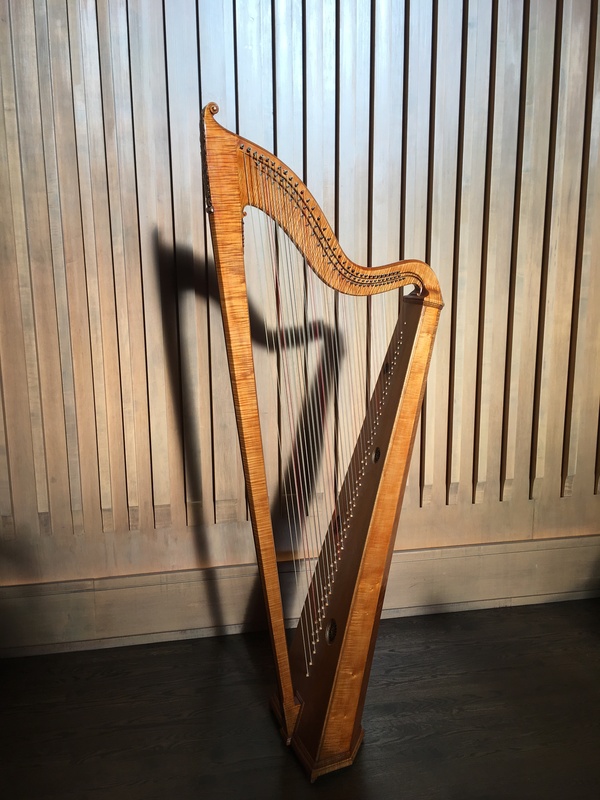 Finding a way to make the harp a continuo instrument, capable of playing a figured bass line with accompanying chords in any key, was the main driver behind the drastic changes seen in the harps of this time. The triple harp, first seen in Italy, flourished from approximately 1590 to 1750 and was so popular that it spread all over Europe. It has an ingenious way of having all notes in all keys available at all times: It has three parallel rows of strings. The outer two rows are tuned to the same diatonic scale (think of the white keys on the piano), with the inner row tuned to the chromatic notes (the equivalent of the black keys on the piano). To make chords, you play a combination of some fingers on the outer rows and some fingers on the inner row, making 3-D shapes with your fingers. This ability to play in all possible keys was a huge improvement over previous harps which, having one row of strings and no way to quickly and reliably alter the pitch of the strings, could only play in one or two keys at a time and had to be re-tuned either during or in between pieces to accommodate key changes. Of course, having three parallel rows of strings makes the triple harp very difficult to play. Not many harpists enjoy tuning all 93 strings every day either! Perhaps that is why I am one of only two professional triple harpists in all of Canada. The glorious sound of the triple harp, zingy like the harpsichord and simultaneously bell-like, more than makes up for any hardships. Considered old-fashioned by Handel’s time, he nevertheless loved the sound of the triple harp too. He used it in Esther, Saul, Giulio Cesare, and he wrote a harp concerto for Alexander’s Feast. Today, the Italian triple harp has settled firmly in to the Welsh culture, where its descendant flourishes as their national instrument. Hear the beautiful sounds of the triple harp performed by Julia Seager-Scott at Handel Alexander’s Feast from Feb 22–25, 2018 at Koerner Hall, Toronto. Tickets are available here. Julia Wedman playing her Jacobs violin at Handel House in London. My baroque violin was made in 1694 in Amsterdam by Hendrik Jacobs. It is on permanent loan to me from violist Max Mandel, principal violist of the Orchestra of the Age of Enlightenment, frequent guest with Tafelmusik, and my former partner and current dear friend. The Jacobs loves being tuned to the low pitches — when it is tuned to A=415 or lower, the voice of this violin is free, warm, dark, and gorgeously rich. There is an intimacy in the quality of sound that I absolutely love and have rarely found in other instruments. The Jacobs can express a kind of emotional vulnerability that connects with people on a very deep level, and I am so grateful for the closeness my audiences feel with me. When I hear other people play it, I am always surprised by how soft it sounds, but its “limitations” demanded that I learn to use my bow in a different way — I have to use the instrument’s natural resonance with focus and strength to project the sound. One fateful day — a blustery March evening of my second year in Tafelmusik — I was walking home after a concert, and as I turned the corner to my street, there was a big patch of black ice. I slipped and fell backwards, onto my violin case, which I had been carrying like a backpack. Ow!!! I dusted myself off, went inside, and took a hot bath to ease the pain. The next morning, I took out my violin to practice. I opened the case and to my shock and horror, the sound post (the little post inside the violin) had smashed through the top of the instrument! It looked so bizarre, I immediately closed the case and started walking around in circles, saying, “That doesn’t look right!” Finally, I worked up the courage to open the case again, and this time, I had to face the truth that I had broken Max’s beautiful violin. Choking back tears, I called our luthier, “Saint” Quentin Playfair, and explained the situation. He told me to gather every little shard of wood in a clear plastic bag, and bring it to him immediately! It took Quentin about six weeks to do a complete restoration. Miraculously, he was able to fix it so exquisitely that I can’t tell where the cracks are, and it sounds better than ever! We open the concerts with a set of variations for solo recorder by the early seventeenth century Dutch carillonneur and recorder player Jacob van Eyck. He was carillonneur of the Domkerk, Janiskerk, Jacobikerk, and city hall in Utrecht, and director of the city’s bellworks, spearheading refinements in the casting and tuning of bells. In 1649, the sixty-year old van Eyck was offered a salary raise “provided that he would now and then in the evening entertain the people strolling in the churchyard with the sound of his little flute.” That same year he published two volumes of variations on popular tunes for solo recorder, named Der Fluyten Lust-Hof (The Flute’s Garden of Delights), presumably drawn from what he played in the churchyard. The Four Seasons appeared in Vivaldi’s 1725 publication of twelve violin concertos entitled Il Cimento dell’armonia e dell’inventione (Bold Experiments with Harmony and Invention). The Seasons, full of audacious experiments of every kind, were undoubtedly the inspiration for the title. The four concertos are accompanied by four sonnets, giving detailed descriptions of the programmatic elements of the music, which paint a vivid picture of life in the Italian countryside in the eighteenth century. The concertos are dazzling proof of Vivaldi’s skill as a violinist and his ingenuity and inventiveness as a composer. We offer a respite from winter this week with Vivaldi’s wonderful depiction of spring, and encourage you to follow the text of the sonnet below. Con dolce mormorio scorrono intanto. Tornan’ di nuovo al lor canoro incanto. Dorme ’l caprar col fido can’ à lato. flow swiftly with sweet murmurings. return to fill the air with their sweet song. the goatherd rests, his faithful dog at his side. Another prolific composer of baroque instrumental concertos was Georg Philipp Telemann. Telemann stated that he was not a fan of the purely virtuoso solo concerto, and indeed we find that most of his concertos are more “conversational” than “exhibitionist,” and that many feature more than one solo instrument. We feature two of these this week: a Concerto for recorder and bassoon, and a Concerto for 3 violins. Telemann was an accomplished player of wind instruments, and his writing for winds is wonderfully idiomatic — well crafted and satisfying to play. The dialogue between the recorder and bassoon in the F-Major Concerto is by turns lyrical and playful. Winds are also prominent in the Quartet in G Major, which features the same instruments as the Vivaldi Concerto da camera. The Concerto for 3 violins appears in the second volume of Telemann’s famous publication titled Musique de table, or Tafelmusik (from which we draw our name!). The title refers to the custom of entertaining guests at ceremonial meals and banquets with music. Each of the three volumes includes an orchestral suite, a concerto for multiple instruments, and a selection of chamber music. The publication was sold on subscription, and the list of subscribers is impressive, including composers, musicians, statesmen, and nobility from all over Europe. Telemann chooses a different orchestration for each piece in the collection, and explores different styles. The Italianate Concerto for 3 violins shows the clear influence of Vivaldi. All of the music in the three volumes is full of charm, wit, and vivacity, and is designed, ultimately, to entertain. There will be a 20-minute intermission. Join us for A Recorder Romp from Feb 8–11, 2018 at Jeanne Lamon Hall, Trinity-St.Paul’s Centre. Tickets are available here. A member of the flute family with relatives in other cultures around the world, the recorder is known to have been in use in Italy by the fourteenth century. The earliest recorders were made from a single piece of wood and came in two sizes. By 1619, the composer and music theorist Michael Praetorius listed eight different sizes, from a small sopranino to a great bass. In the seventeenth century the recorder’s design gradually changed to incorporate a more conical bore and a division of the instrument into separate joints, and by the turn of the eighteenth its appearance and range took on the one we’re most familiar with today. Though various sizes of recorder were still made and played, the alto recorder was the size most commonly seen in a solo or small ensemble role. The recorder can boast a wealth of repertoire by composers both well known and less familiar. Handel composed wonderful sonatas and chamber music for the recorder, and some of the most delightful recorder obbligato parts ever written are found in his operas. J.S. Bach used the instrument in over twenty of his cantatas, the Easter Oratorio, and the Second and Fourth Brandenburg Concertos. And Telemann’s own skill as a recorder player is reflected in his brilliant and demanding solo and double concertos, chamber music, solo sonatas, and cantata obbligato parts. Recorder instruction books for the amateur market continued to be published into the 1790s, but the instrument was a poor match for the classical and romantic aesthetics, and for the developing orchestra, so it spent most of the nineteenth century in a deep sleep. The twentieth-century early-music revival resulted in a true recorder renaissance which continues to this day. Hear recorder soloist Alison Melville perform in A Recorder Romp from Feb 8–11, 2018 at Jeanne Lamon Hall, Trinity-St.Paul’s Centre. Tickets are available here.